Due to a hectic day, we didn't get around to posting our dessert yesterday, but that doesn't mean we didn't have one! Tartine being one of the vendors at last weekend's Super(Duper)Market, was one of the main draws of going to check it out. I was hoping they would have their fabulous cookies. I was admittedly disappointed when they had a very limited selection, but decided to try out their brownie. It's not a usual choice - we're not brownie people at Lunch, but my logic was this: they wouldn't trek all the way from San Francisco to sell a not so good brownie. So, the verdict? It was indeed a very elegant brownie, with rich cocoa flavors that did not overpower. 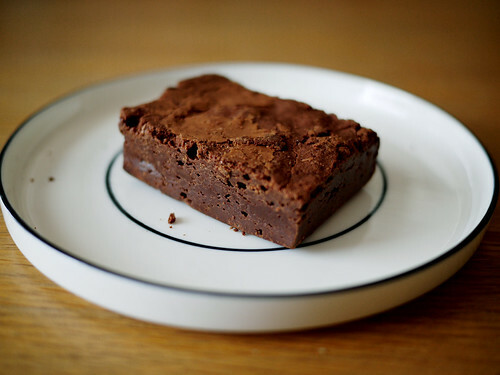 Even we could from time to time crave this brownie. That being said we still want their chocolate chip cookies!